Ken Lundemo is a native of Washington State, born in Tacoma in 1931 and raised in the Puget Sound region. He has lived in the area all his life and now resides in Seabeck, Washington with his wife Inez. Their home and his studio is located on twenty acres of woodlands where he also has an anagama wood fired kiln. This kiln is an important meeting place for potters in the Northwest who are working in wood fired ceramics. Ken first studied art with Harrison Blass at Olympic College in 1949-50 and returned to study there on the GI Bill in 1955 after four years in the Navy. He studied commercial and fine art, attending evening classes while working as a lineman and cable splicer for Pacific NW Bell. 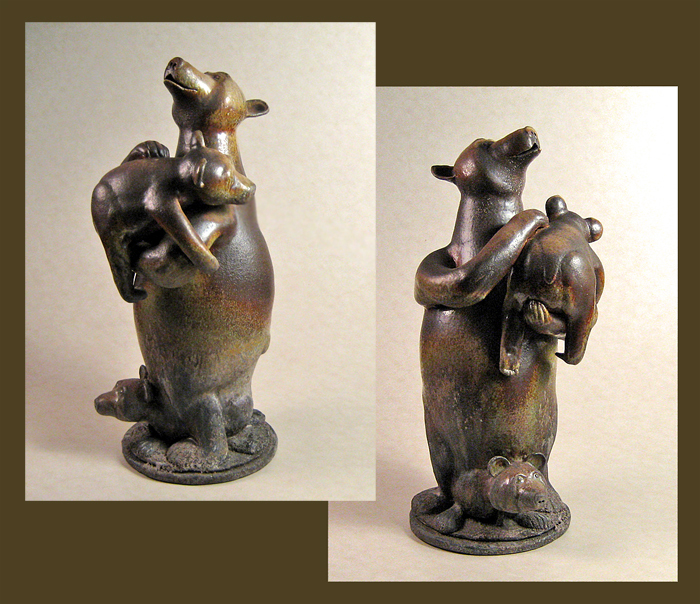 Ken later took classes in ceramics and bronze casting at Olympic College, receiving an Associate of Arts degree. 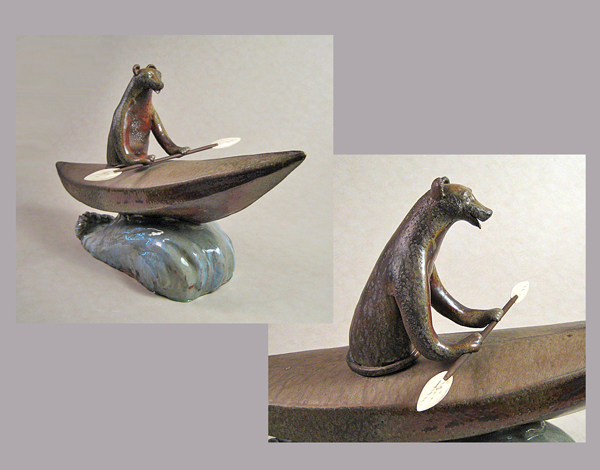 Ken works with wood, stone, metals, plastics, glass, found objects and ceramics. 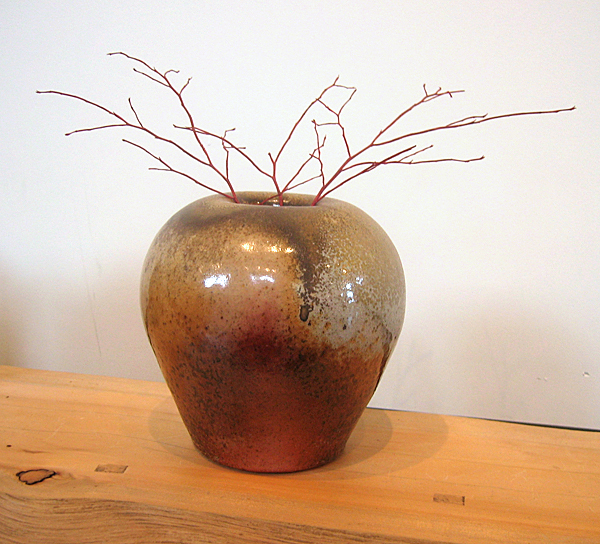 Sculpture is his primary focus with raku and wood fired pottery his second love. Ken is a founding member of Collective Visions, a cooperative art gallery in Bremerton where he regularly shows his sculpture and pottery. He also shows his work in other regional galleries and competitive shows. His work is represented in many private and corporate collections and he has won numerous awards. 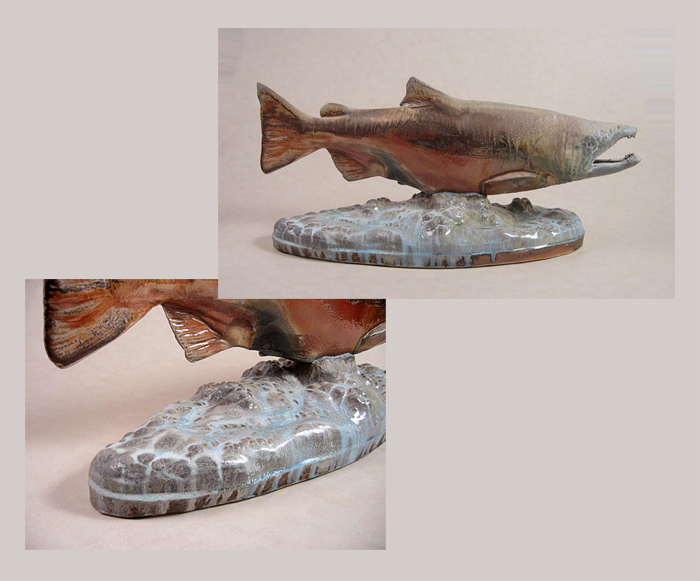 Ken’s recent work has been in wood, stone, bronze and clay. 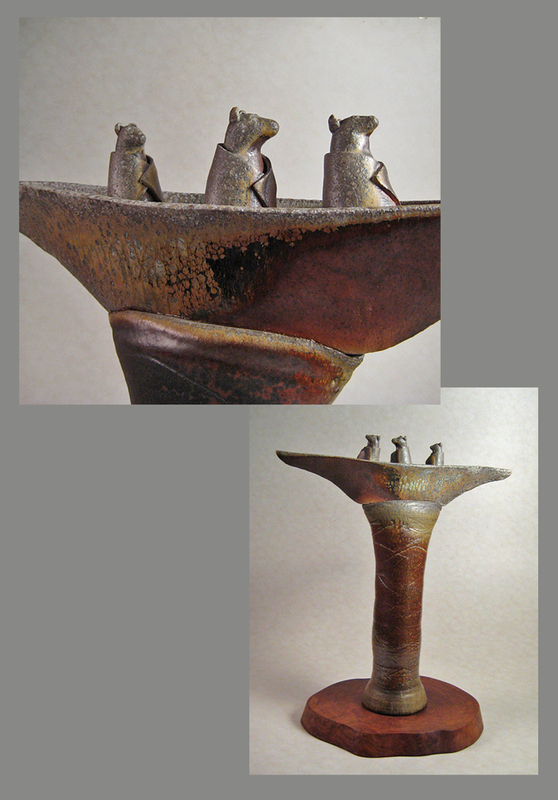 Sculpture in a wide range of methods, materials and scale along with raku and now wood-fired pottery has been his main focus. Commissioned work is welcomed. He was commissioned to do the first sculpture purchased by the Washington State Arts Commission for its percent for art in public places program in 1975. The sculpture was a steel Viking longship for the Poulsbo Elementary School in Poulsbo, Washington. 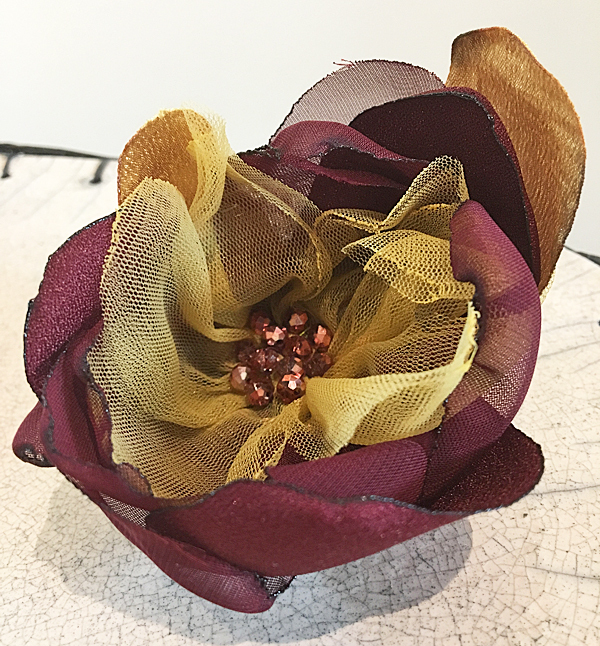 “I have drawn inspiration from nature and our beautifully diverse countryside here in the Puget Sound area, exploiting native materials as well as exotic and imported wood and stone. The human figure and wildlife provide many avenues for exploration and abstraction. 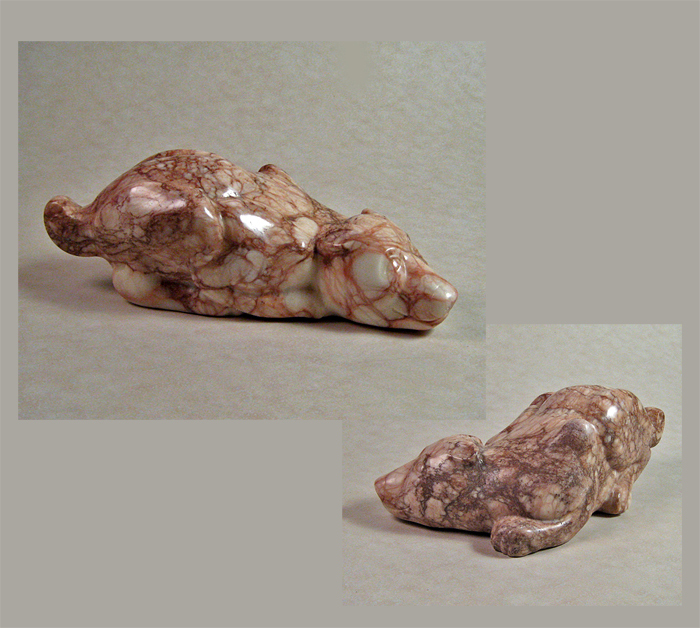 The female form has been a favorite and I’ve done drawing and sculpture on the subject for fifty years. Uncle Ted and the Twins. Wood-fired ceramic, stoneware. Dimensions: 35” t x 17” w.
Bound for Baja. Wood-fired ceramic, stoneware. On fir burl. Dimensions: 32” l x 37” t x 18” diameter. "Courtship." 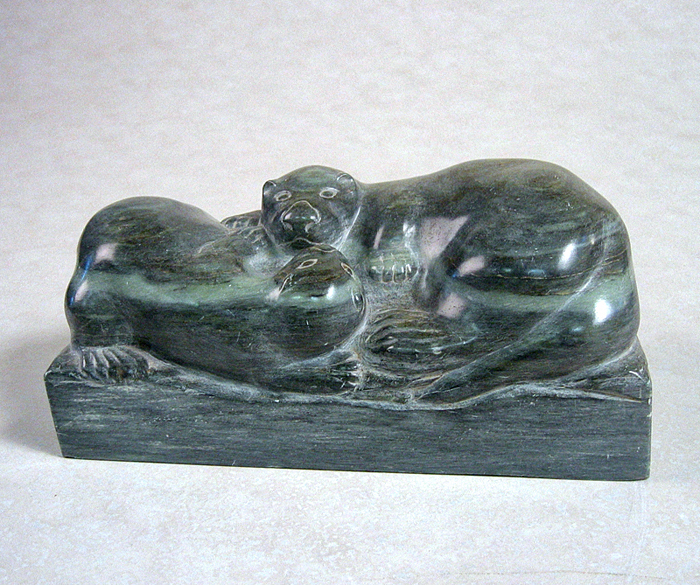 Carved soapstone. Dimensions: 12” w x 5-1/2” t x 6-1/4 w.
Fall Journey. Wood-fired ceramic, porcelain. Stoneware base. 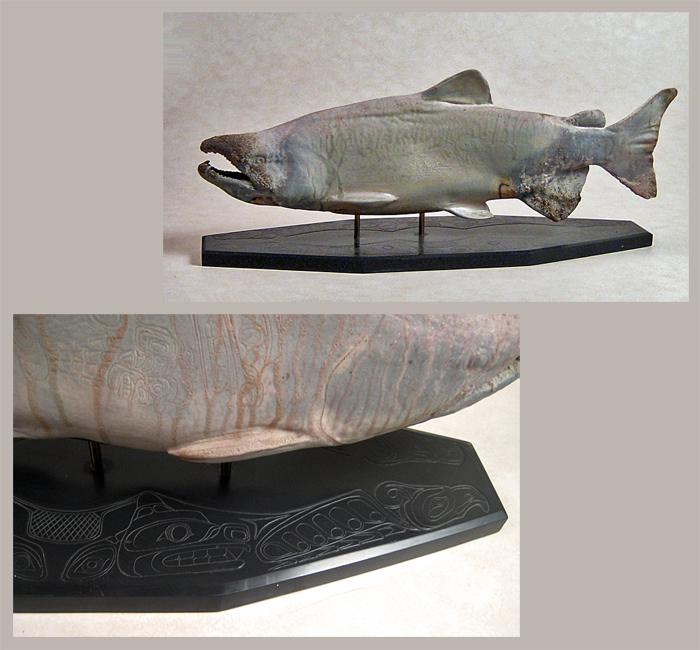 Dimensions: 18” t x 34-1/2 t x 12” w.
Northwest Spirit. Wood-fired ceramic, stoneware. On carved slate base. Dimensions: 33” l x 14 t x 11 w.
Wood-fired ceramic straight-sided and ridged shino vase. Dimensions: 8-1/2 x 5 inches. Details coming soon; please contact the Gallery for information. 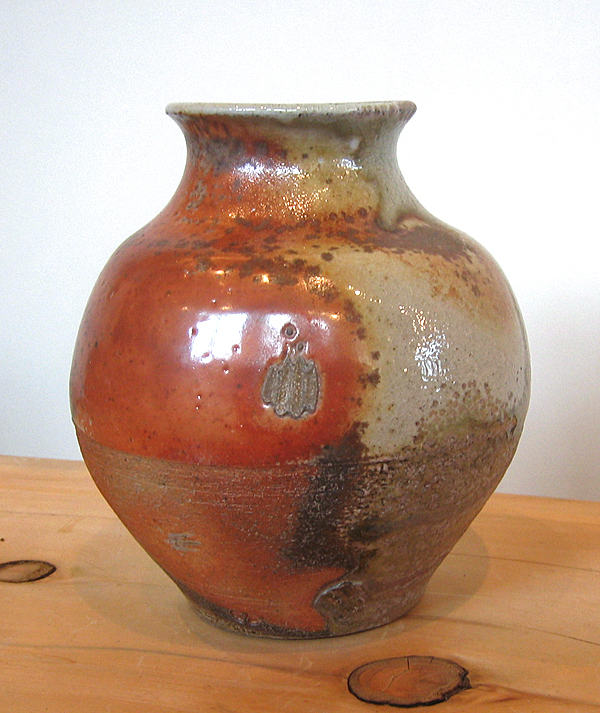 Wood-fired vase, round. 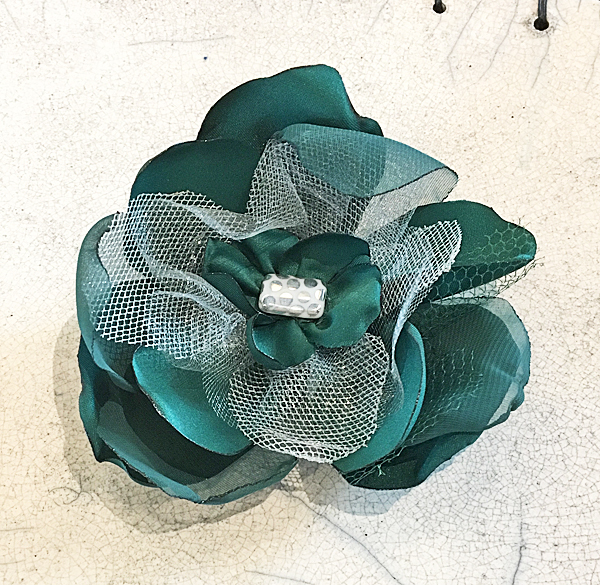 Dimensions: 6-1/2 x 6-1/2 inches. 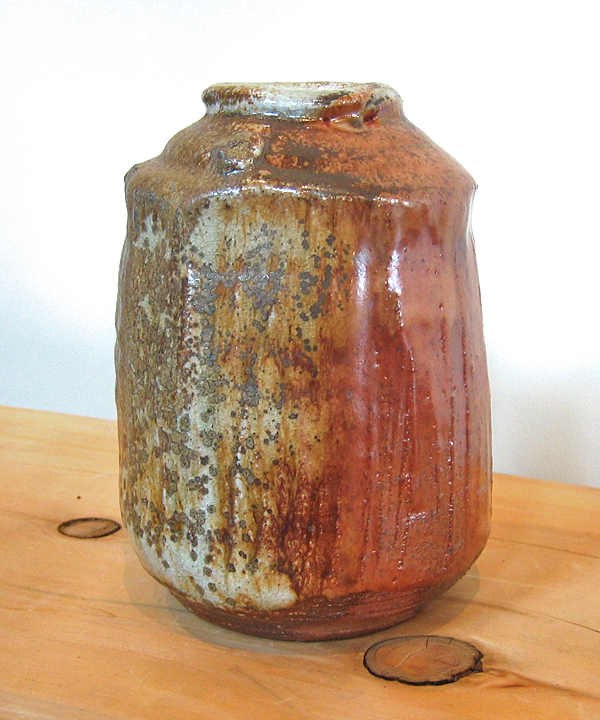 Wood-fired vase, round; shino glaze. Dimensions: 8-1/2 x 7 inches.